I spent the weekend making a start on the Beyond the Cherry Trees quilt. It seemed the most simplest one to start with so I began with Block #2. Because I'd like this project ready to take to my Bee, and easy to transport, I opted to try pre-basting the leaves, and using Roxanne's glue to hold them. This way I can just grab my needle, thread and snips and get to sewing. 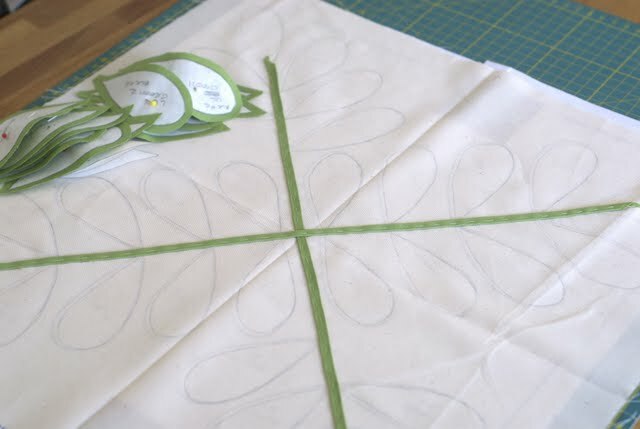 The background is Natural Moda Muslin, and I'm using Modas' Bella solids for the leaves. I'm really looking forward to learning a lot from making the quilt! I love seeing projects from beginning to end! I'm starting another block for this quilt too, I chose simple as well. This is a nice one to stitch, I hope we get to see it soon. Lovely to have you join me thanks, Heidi - love your blog. Looking forward to good times! I stitched this one first too! It is a good simple one to do. have fun!